Many of you have been following the journey of my brother in law Lefty-David Snyder since March 4th when he suffered a brain aneurysm. We are extremely happy to let you know that this walking miracle walked his way right out of rehab and into his own home last week. While there is still a long road ahead, the miles that have already been traveled and the hurdles that have already been overcome are beyond comprehension. Thanks for everyone’s support and well wishes. 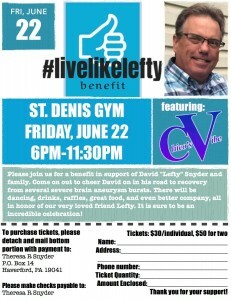 Hope to see you at his benefit on 6/22. 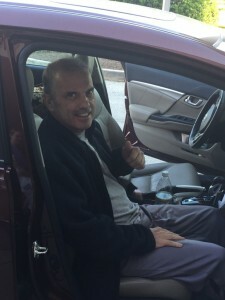 This entry was posted in health & fitness, motivation and tagged bee foundation, brain aneurysm, live like lefty, oneinfifty, road to recovery. Bookmark the permalink. Both comments and trackbacks are currently closed.